It seems that, if recent output by architecture faculty and students is any indication, it finally is okay for architecture to laugh. The timing is a bit curious, given the state of affairs in the world; sincerity and urgency might seem more fitting. But perhaps humor is the last (and best?) form of provocation with which to confront the utterly serious problems of political uncertainty, social inequity, and environmental instability. After all, humor, at its most effective, quickly cuts through the superficial to criticize the structural. Architecture’s playful turn, in this sense, should not be mistaken for irreverence. The setup for a good architectural joke pulls heavily from a deep respect for the discipline and its history. Humor as a method of critique is always an inside joke, emerging from a deep reading of an institution to point out its absurdities under the assumed guise of an outsider, a rebellious observer. There are no truly abstract jokes—a punchline only works with a setup. Context matters. Within the context of architectural education, humor offers a productive insight into the construction and criticism of pedagogy. Pedagogy is fundamentally an institutional affair, defined as much by faculty, as by the structures of accreditation and academic administration. Yet it itself is not a fixed institution, but one whose premise is repeatedly challenged. Each challenge is a rebellion against the perceived status quo. Like a good joke, these rebellions both understand and construct the context in which they operate. Like a good comedian, the rebels leading the charge also understand the necessity of fresh material. Pedagogy must continually be rethought to avoid becoming stale. The history of architectural pedagogy is often understood as a series of breaks from established practices. 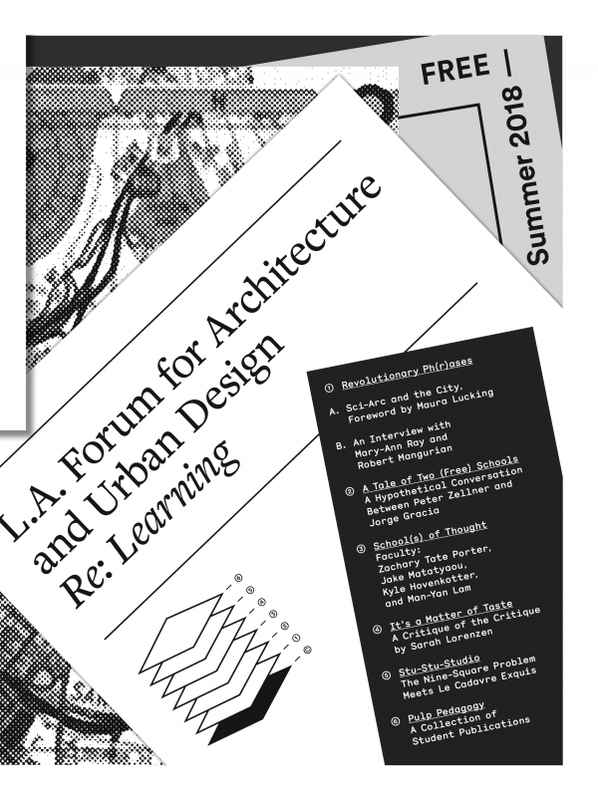 In Re: Learning, we’re taking on the tradition of rethinking architectural pedagogy. We’re looking at both the content of pedagogy and the mechanisms for its questioning. Humor, fiction, propaganda, DIY—all are potential avenues into reconsidering how, what, and why we teach. “Revolutionary Ph(r)ases,” an interview with Mary-Ann Ray and Robert Mangurian, and “SCI-Arc and the City,” Maura Lucking’s foreword, convey gems of experienced-radical wisdom. “A Tale of Two (Free) Schools,” the transcript of a hypothetical panel discussion between Jorge Gracia and Peter Zellner, draws out the rationales behind the two newest architecture programs in the region. “School(s) of Thought” offers Zachary Tate Porter’s, Man-Yan Lam’s, Jake Matatyaou’s, and Kyle Hovenkotter’s critical interpretation of the architecture academy’s current foci. And, Sarah Lorenzen blows the whole thing up with her critique of the critique. These writings raise a few issues for architecture education. And, certainly, they leave issues out: adjunct faculty benefits and compensation, underrepresentation of women and minorities in the profession, abuses of power laid bare by the #metoo movement, to name a few. But, perhaps most telling, is the familiarity of the majority of the concerns. It’s the efforts to defamiliarize the topics—through plays on structure and tone—that seem most provocative. In other words, the content of Re: Learning registers the convention of both the objects and cycles of pedagogical rebellion. The humor with which the material is presented, though, is what stretches. With one lighthearted challenge to the delivery mechanisms, it introduces format as a catalyst. It starts to suggest that maybe we’ve missed the point of rebellion … or, rather, the joke. This publication is made possible in part by a grant from City of Los Angeles Department of Cultural Affairs.